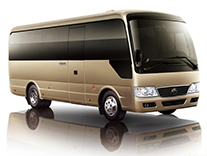 At the 8th CHINA TRANSPO in 2006, zk6128hb Yutong Bus assembled the forged aluminum wheels,which was the first time for it to apply in the domestic bus brand. Compared with steel wheels or casting aluminum wheels which is widely used in domestic commercial vehicles, the advantages of forged wheels are obvious. Firstly, the weight of forged aluminum wheels is much more lighter than steel wheels, so it can save fuel. Secondly, the security has been improved greatly. Under the same load conditions, forged aluminum wheel hub can withstand a larger load and it has a good stiffness.Thirdly, forged aluminum wheels loses its heat quickly, which can not only to increase the service life of the brake, but also to reduce the risk of flat tire. what’s more, the roundness of forged aluminum wheels can reach to 0.05mm to improve the stability，road holding and braking of the car. 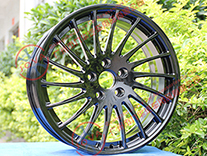 With the increasing maturity of the advanced manufacturing technology and precise forging technology, the application of forged aluminum wheels on special vehicles will be more and more. China has become a manufacturing center of aluminum automotive wheels in the world now. Actually China has strong advantages in the production of aluminum wheels, the reasons are as following: First, the labor costs are lower than that of private enterprises in European Union. Second, China is the world’s largest alumina supplier, and has obvious advantages in alumina prices. Some wheel manufacturers set up factories in the vicinity of alumina manufacturers, such as Sanmenxia Dicastal; or alumina suppliers set up their own aluminum wheel factories, such us Chiping Xinfa. Third, China is the world’s largest automobile market and vehicle production base, and most aluminum wheel manufacturers are near automobile production bases or ports to save logistics costs. 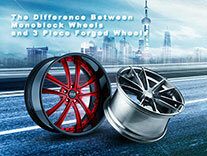 In the wheel industry monoblock forged wheels and 3 piece are two of the most popular types of forged wheels. The terms "monoblock" and "3 piece" refer to the construction of the wheel, but the similarities end there. In fact, there are many differences between the two types that make each ideal for different kinds of automotive applications. Monoblock wheelsale also referred to as "one-piece" wheels, meaning that they are forged into a single part without any removable components. During the manufacturing process a monoblock forged wheel begins as a single, round block of 6061-T1 aluminum alloy. The aluminum block is compressed and subjected to intense heat which creates a dense grain structure and forms a round, blank piece of metal. The single piece of aluminum alloy is then flow-formed and placed in a CNC milling machine where the spokes are formed to finish the manufacturing process. Being that monoblocks are made from a single piece of aluminum alloy, they are the lightest of forged wheels. Their low weight is sought after as they help to reduce unsprung mass which can reduce acceleration times, enhance braking, and improve handling. Monoblock forged wheels are often less expensive than their 2- or 3-piece forged counterparts, as fewer parts are used for construction. However, if a monoblock wheel is damaged or bent they are difficult to repair, often requiring a complete wheel replacement. 3 piece forged wheels offer different advantages over monoblocks, mostly from a styling standpoint. A 3 piece wheel has three main parts: a center, the outer hoop or "lip", and the inner hoop. The manufacturing process of 3 piece wheels is similar to that of a monoblock, except more aluminum alloy blocks are used due to the increased number of parts. After all of the pieces are milled, they are fastened together using a number of perimeter bolts and sealed using Silicone RTV. The construction of 3 piece forged wheels allows manufacturers the ability to offer a wider range of widths and fitments for customers. 3 piece wheels are also the most customizable as any of the components can be easily painted or chromed to create a unique color scheme. If they sustain any damage it can be readily replaced. In addition, 3 piece forged wheels retain the highest resale value amongst used wheels. 3 piece wheels are not without their disadvantages. They are the most expensive forged wheels because of their multi-piece manufacturing, and if the RTV Silicone seal is broken, leaks can form.